An 1800's Country House with original Liberty Antique furniture and wooden ceilings. All 5 apartments are extremely spacious with large modern marble tiled bathrooms. Two kitchens have open fireplaces. The apartments of the villa have beautiful antique furniture, designed walls, and original Palladiana floors just like a villa from the 1800's would be. The Apt. Glicine has a large terrace with the view to the Monte Cetona, apt. Margherita has a balcony overlooking the lake. From most other bedrooms and terraces you have a lovely lake view through the large windows doors. All apartments have TV. In front of the house, and at the sides there are tables and chairs to dine outside. Deckchairs invite for sunbathing. BBQ an old wooden pizza oven are next to the house, also billiard and ping pong is there to be used. Special offers for 2 weeks stay. Please ask quote. The apartments: Apt. Glicine (Wisteria) 170 qm, 1 bathrooms, 1 double bedroom, 1 bedroom with 2 single beds, 1 kitchen, separate Living room with 2 sofas and large dining table, large terrace shaded dining table, 2 deckchairs. Apt. Papavero (Poppy) 120 qm, separate entrance, 2 bathroom, 2 double bedroom, 1 extra bed for 1 Child in entrance hall, large kitchen / living room with fireplace. Apt. Fiordaliso (Cornflower) 80 qm, 1 double bedroom, 1 single bedroom, 1 bathroom with bathtub, large kitchen / living room with fireplace and beautiful old umbrian furniture. Apt. Margherita (Daisy) 70 qm, 1 double bedroom, 1 bathroom, kitchen / livingroom with romantic private balcony facing to Lake Trasimeno. Apt. Gelsomino (Jasmine) 120 sqm, entrance, 2 bathrooms, 2 double bedrooms, 1 bedroom with 2 single beds, large kitchen / living room with fireplace. Each apartment possesses a cooking area (fridge, cooker with at least two gas eaters, electrical oven, basin and plate dryer) in addition all household appliances and plates. Each apartments has a television and is given with all linen (bed, bath and kitchen linen) and it is changed weekly. The cleaning of the apartment is done weekly. Each apartment has all cleaning material for the daily chores. We distinguish ourselves not only by the beauty of the house, its location and tranquility, but by our great service and continuing efforts to make the experience of vacationing at Villa La Fontana the best it can be. We provide full support on the ground, whether it be helping to find the perfect restaurant, recommending outings, locating the right babysitter. We are continually looking for and implementing ways to make the Villa better and our guests' experience optimal. This year, we invested in more lovely garden furniture and umbrellas, cooking equipment, decorative painting and garden improvements. We know we are not the cheapest but are confident that we provide the best value. Please contact us and see the difference ! Nous avons séjourné une semaine à Villa La Fontana. La résidence est très agréable, parfaitement entretenue, l'appartement correspond exactement au descriptif. L'environnement est très calme, dans la verdure, à quelques minutes à pied du lac. Nous recommandons très vivement cette location où nous espérons revenir. Merci à Alviero et son équipe pour leur accueil et leur professionnalisme ! Our experience here was first-rate. We were two couples---it would be fine for three couples or a large family. The house is clean, all normal amenities supplied. Rooms well furnished, beautiful views in all directions. There are plenty of stores within a few miles should you want to cook. The nearest town is about 5 kilometers--Castiglione del Lago is a charming hill town with excellent non-touristy shops and restaurants. We basically chose a different hill-town each day and explored Umbria and a bit of Southern Tuscany. It was the perfect location for Todi, Sienna, Pienza, Gubbio, and many other towns, all within an hour or a bit more. All advertising and photos were absolutely accurate except that no photo can capture the charm of the countryside in full. Go to Umbria before it is as touristy as Tuscany, and this is a great starting point. Really nice villa in quiet rural area but close to town with excellent pool area/games room - ideal for kids. The house was amazing. I'm so glad I had the opportunity to stay here during my first trip to Italy. One of the best vacations I have ever been on, and one of the main reasons is due to the house itself and the location, can't beat it! 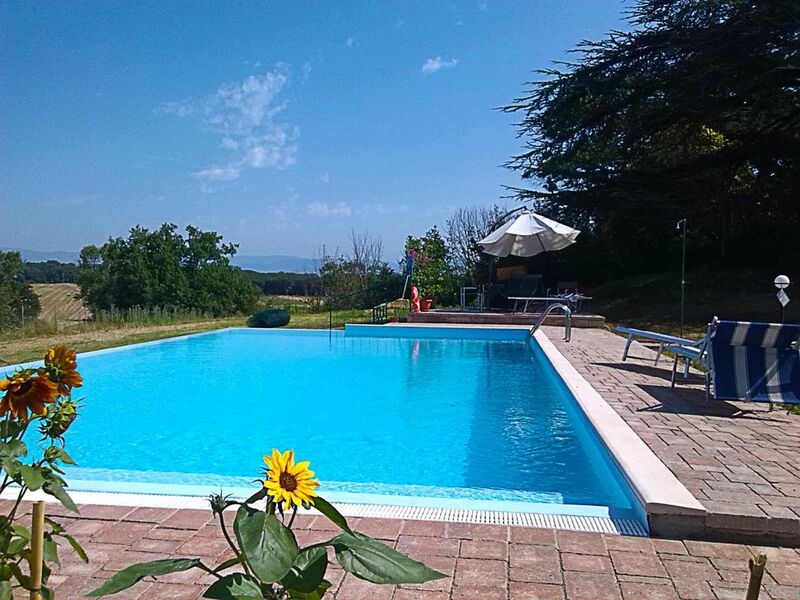 The house is beautiful inside and out including great amenities also, the beautiful bedrooms on views lake Trasimeno. Overall amazing trip! Would come back in a heartbeat! We enjoyed our stay very much at this lovely and quiet place, with a fantastic panoramic view in this cosy house. The house has a very tasteful and personal interior. Comfortable spot, with a very kind and helpful owner. Torno the village is beautiful place, with a nice little harbour and which is not so crowded. we are sure coming back soon. The house was beautifully furnished, spotlessly clean and so well equipped and the garden and pool wonderfully well looked after. On the one day it rained the house was so cosy that it didn't matter. The views were breathtaking and the peace and quiet very welcome. Easy drives to Assisi and Siena and we particularly liked Cortona a beautiful walled town nearby. We visited several of the restaurants recommended by the owner and all were lovely. The owners were extremely helpful and responded to emails very promptly. Villa La Fontana is simply one of the most beautiful places that we have stayed and we would certainly return and hope to do so in the not too distant future. 40 mninuti SIENA, PERUGIA 20 minutes, Assisi is located just 30 minutes. There ineressa archeology and the Etruscans? : CHIUSI from Villa La Fontana is a 10-minute macchiana, Tarquinia and Cerveteri about u'ora. Are you lovers of good wine: we have the best Italian wines: The Brunello in Montalcino, an hour's drive, the Nobile Montepulciano 15 minutes, the CHIANTI an hour, the SAGRANTINO in half an hour. Politica di cancellazione : a) fino a 120 giorni prima dell'arrivo : rimborso totale del deposito b) la cancellazione dopo 120 giorni prima dell'arrivo la caparra verrà trattenuta, se l'appartamento non può essere affittato nuovamente. In caso di partenza anticipata verrà addebitato l'intero importo.